Social Inclusion breezes at Pimlico on May 12, 2014 before the Preakness Stakes. With a pair of eye-catching victories at Gulfstream Park this winter, Social Inclusion stamped himself a 3-year-old to watch. Although the speedy colt lacked the points necessary to get into the Kentucky Derby after managing a third-place finish in the G1 Wood Memorial, only the third start of his career, he will challenge California Chrome in Saturday’s Preakness Stakes. 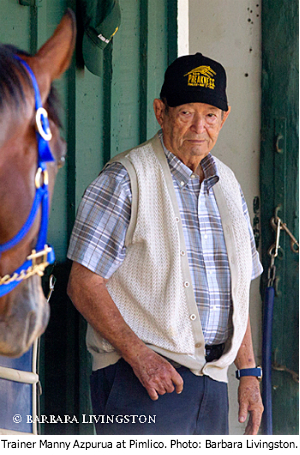 Manny Azpurua, the colt’s 85-year-old Venezuelan-born trainer, talked with John Scheinman. For four days before Kentucky Derby winner California Chrome came to town, the diminutive 85-year-old trainer Manny Azpurua and his colt Social Inclusion had the Pimlico Race Course stakes barn to themselves. On those quiet mornings, Azpurua sent out exercise rider Domingo Navarro and Social Inclusion for 1 1/2-mile gallops after the 8 a.m. track renovation break. Scarcely another horse – bound for the $1.5 million G1 Preakness Stakes or otherwise – was to be found. The few racing writers milling about afterward preferred interviewing Social Inclusion’s gregarious and outgoing owner Ron Sanchez, because he spins good stories full of baseball players and surfing at Ocean City, Maryland, along with sharp commentary about his fast horse. Azpurua, quieter and less easy to understand, mostly sat alone next to Social Inclusion’s stall, under the barn’s awning, out of the sunlight. Despite a training career in South Florida dating back to 1980, Azpurua, a native of Venezuela, has never been the center of attention with a big horse in this country. That could change dramatically in less than two minutes Saturday if Social Inclusion can overcome his relative inexperience and run to the level of his performances this past winter at Gulfstream Park. With only three races to his career, Social Inclusion is nonetheless considered the principal threat to California Chrome’s quest for a Triple Crown. Pimlico linemaker Keith Feustle listed California Chrome as a commanding 3-to-5 favorite to win the Preakness at a boisterous draw party Wednesday inside an infield tent, but the 5-to-1 second-choice status he bestowed on Social Inclusion in the field of 10 was an expression of respect for a horse that broke the Gulfstream 1 1/16-mile track record in just his second start March 12. In that race, he left then-Kentucky Derby favorite Honor Code spinning helplessly, 10 lengths back. Asked if Social Inclusion is the best horse he has ever trained, Azpurua simply said, “I believe so.” Then asked if his own time has finally come, his response is equally as brief. Social Inclusion’s lone defeat came in a courageous third-place effort in the G1 Wood Memorial at Aqueduct Racetrack, a race in which he drew the outside post, broke slowly, rushed up to duel for the lead, took over at the top of the stretch, and then tired. Sanchez, earlier, reportedly turned down an $8 million offer for the horse, wanting Azpurua to remain in charge of his career. In Venezuela, the Azpurua name is a grand one in racing circles. Manny’s father, Manuel M. Azpurua, was a prominent breeder and trainer as well as a director of the Hipódromo Nacional El Paraiso, one of three major tracks in the country. Azpurua’s father didn’t want his eldest son to follow him into the racing life and sent young Manny to a military academy in Manlius, outside of Syracuse, New York. Upon graduation in 1949, Azpurua’s family sent him to the U.S. Military Academy at West Point to train as an officer, but he did not like it and went back to Venezuela. Azpurua’s brothers, Eduardo and Leo, both had successful careers before migrating to the U.S., where they also worked in the industry – Eduardo founding a successful breeding farm in Ocala, Florida, and Leo as a trainer, farm operator, and bloodstock agent. Manny, however, was the most successful of all in his home country, winning 247 stakes and more than 3,500 races before moving to Florida 10 years after Leo in 1979. In Florida, mostly at Calder Race Course until a move to Gulfstream a few years ago, Azpurua has usually worked with 20 to 25 horses at a time. He finished third in the 2006 Breeders’ Cup Sprint with Nightmare Affair, but has never attracted big-ticket owners. Sanchez has injected new life into an aging program. As he has grown older, Azpurua’s results have improved. He has topped $1 million purse earnings five of the past 11 years. He bought Wildcat Lily for $20,000 at the OBS August Yearling Sale and won two stakes with her while placing second in the G1 Test and Prioress Stakes at Saratoga Race Course, earning $427,065. He claimed Street Girl for $45,000 in December 2012 out of the maiden claiming race won by Wildcat Lily and earned $380,976 with her. Street Girl ran in the Breeders’ Cup Distaff last year and finished second in the G1 Humana Distaff this spring at Churchill Downs. Azpurua watched Art Sherman become the oldest trainer to win the Kentucky Derby at age 77 two weeks ago with California Chrome. If Azpurua wins the Preakness, he will eclipse the Hall of Famer Sunny Jim Fitzsimmons, who won the second leg of the Triple Crown with Bold Ruler at age 82 in 1957. Azpurua said he finally may have the one big horse that has always eluded him.